Sailor Boy and I went to see WALL·E last night (in passing, I wonder how many journalists now know how to find the “middle dot” symbol on their computers, thanks to Pixar?). So great! I loved it. I laughed and laughed. I had been scared to see it, previously, because I get a little worked up over animated films (I have seen The Incredibles dozens of times, and when Mrs. Incredible screams at her daughter while the plane is crashing, I still burst into tears). 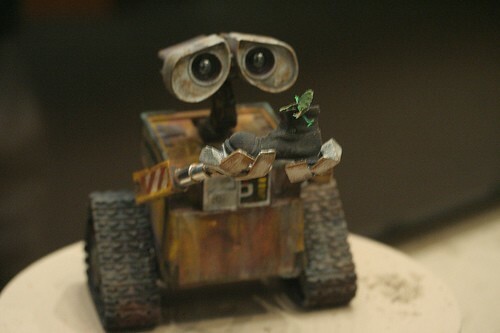 Anyway, Wall·E is so cute and adorable that I knew they were going to put him in a lot of danger throughout the course of the movie, and if they killed him off, I was going to be very, very, very upset. Manipulative Pixar bastards. Anyway, I thought it was a great movie. Not The Incredibles, but definitely up there in the panoply of great animated flicks. Robots in love is pretty much a go-to plotline, as far as I’m concerned. Then again, it’s possible that I watched the Brave LIttle Toaster at an impressionable age. I’m inexplicably in a cooking mood of late. Yesterday I made these phenomenal quinoa and corn-stuffed roast peppers with a spicy, garlic and cumin infused tomato chile sauce. Delicious! Today, i may make brunch and surprise SB, who is still asleep. Depends on how quickly I can get to the store and back. First, your header totally cracked me up. You know SPIKE ran a STAR WARS marathon this weekend. For those of us laid up by surgery, it was much appreciated, even if I did have to endure those sequels otherwise known as episodes 1, 2, & 3. Haven’t been out to see any movies, obviously, but my daughter has seen WallE twice (no, I don’t know how to find the little dot.) I can’t wait to see it. And Kit Kitterage. And Mamma Mia. Cut a hole in the top of the peppers and core, removing all seeds. Mix all other ingredients in the pepper stuffing and stuff into peppers. Place in roasting pan with 1/2 inch of water and put in the oven for 45 minutes. For the sauce, heat oil medium-high in skillet or saucepan, then crush the garlic cloves and add them and the dried chili peppers to the oil. Cook until garlic has turned golden brown, then remove cloves and chiles and set aside. Add cumin and saute for a bit, then add the tomatoes, smooshing with a fork. Cook and stir for another minute, then add the soy sauce. Salt and pepper to taste over the next ten minutes, then add the sugar to taste. Puree the sauce with a food processor, blender, hand blender, etc. Keep warm. Serve spooned over the finished peppers. Have to agree with Julie Leto… when I saw the title of the entry, I thought of the Star Wars marathon Spike did this weekend (and the Darth Vader golfing commercial that had me laughing). Yum, that stuffed pepper dish sounds great — and vegetarian, too! I’m going to try it (once I really believe it’s safe to eat tomatos in Florida again, lol). My daughter saw Wall-E and loved it too. Hope I can get out to see it this week. Your title cracked me up, too (even though I missed the Star Wars marathon). My nieces and I caught the Star Wars marathon in between the Harry Potter marathon on ABC Family. Their mom is taking them to see Wall*E and I will be taking them to see Kung Fu Panda and the Kit movie. I loved The Incredibles! My nieces laugh that I have as many Pixar movies as they do…and they aren’t even for my nieces. I have no comments regarding either Pixar or stuffed peppers, but I have a complaint for you, Ms. Peterfreund. I picked up RITES OF SPRING (BREAK) last night, hoping to read a chapter or two before falling asleep and I stayed up until 5 AM reading. Once the romance picked up, I couldn’t put it down, and once you threw Nazi china and barnyard metaphors into the mix, you might as well have chained me to the book. Phyllis: I think if you used canned it’s fine. I used canned (I think the one I used for the stuffing had “minced mild chiles” in it too). We’re vegetarianish around here lately, too. Hehe… Stacy- I picked up ROS(B) at the store yesterday and last night the hubby asked me why I wasn’t picking it up to read before bed. I told him that I’d be happy to if he’d be okay with me reading with the lights on till the wee hours of the morning. Never start a Diana novel right before bed because sleep will never happen! oh the movie was SO awesome…. but hello? you totally didn’t mention the completely Squee-worthy short that came before it! i loved that rabbit!!! !